Fond Pet Memories wants to personally thank you for wishing to share with the world, cherished information about your beloved pet. This service is free. A unique page will be created on this site, dedicated to your deceased pet. Please feel free to submit a photo of your choice and personal description of your pet. Please allow up to 24 hour turn-around for us to post your pet’s information. I’m so sorry for your loss. I feel your pain I lost my Brutus pit/boxer June 21st 2018, and I’m still crying. He was my best friend, we had a bond that will never break, he loved me and I him so much so we knew what each other was gonna do 15 seconds before we did it. We didn’t much fit in with people ourselves. I’ll keep you and Buddy in my prayers. Peace to you. Buddy was born on Dec 2011 and died today on June 14, 2018. He was my best friend, my companion, and the only person who loved me for who I was. Buddy got me through my weird hs years where I didn’t fit in but he always made sure I was loved. He got me through college where I was becoming a young adult and supported me now all the way up into my early 30s. Buddy you made me a better person, you loved me and I loved you and I will never forget the way you licked my face or brought me socks when I was sad or in a mood. I miss you so much and I still feel like I can hear you running down the hallway to jump on my bed and give me kisses. You will always be in my heart forever. I need to get these feelings out of me. Sensitive companion and shoulder to cry on. It is hard to find words that accurately convey the bonds we create with our pets. I think back to childhood pets and how much they enriched my life growing up. Even after leaving home, just knowing that whenever you visited, they would be there to greet you and spend time with you was a comfort I felt many times with our dogs and my mom’s cat. Pets have added so much to my family and my life. I got Brahma as a puppy (8 weeks old). He was the first pet I adopted after moving out of my parents’ house. The first life I ever had responsibility over. He ate everything I owned that first year (and a lot of things that OTHER people owned, too). He rode in the car across the country to California where was the happiest I think I ever saw him. He loved running around and playing at the dog beaches in San Diego. He loved taking sneaky naps on the couch, belly up and snoring. When I moved to Brazil, I brought him with me. I remember how much trouble it was to move a pet to another country. I think the move to Brazil stressed him in a lasting way and I’ll always feel guilty about it. I remember having to nurse him back to health when shortly after the move he was attacked by two Dobermans. I thought he was going to die but he pulled through after surgery on his back leg and a few days later he was sent home with a tube that I had to drain every couple of hours. It was rough on me. It was rough on him. It was a real learning experience for me as a 19 year old. After that I moved to the Recife and Brahma loved pulling me on the skateboard up and down the beach sidewalks at night. Everyone was afraid of his size which made me feel safe, and I know he would have protected me if anything would have happened. He loved it when I invited him into my bed in the morning and he and I would go back to sleep with our backs touching. He loved getting his ears scratched and used to make the funniest noises whenever I massaged him. When I went through a few rough patches in Brazil, Brahma never left my side. He would sit quietly while I threw my arms around him and cried into his neck, he would only move to occasionally lick my knee or my chin. I moved to Dubai after that and I’ve never forgiven myself for leaving him behind. My plan was to go to Dubai, get settled and then bring him over but a divorce and breakdown prevented me from doing that. The last moment I spent with him was when he was sitting in the sun on the patio of the “Sítio”(farm house). I held his head in my hands and rubbed his ears. I still remember pulling out of the driveway and seeing him peeking his head around the corner of the house. He could sit, lie down, give high fives and was learning to roll over when I left. He loved being with the people he loved. It was a party when I would come home from work. He loved running and he was so fast! Most of the time he just looked like a blur of blonde fur leaping over bushes. I have often wondered if Brahma ever thought about me after I left. Or if he resented me or felt depressed. It rips me open to think about things like that. But any time I see dogs on tv I think about it. Of all the dogs I ever owned, Brahma had the biggest impact on me. He taught me patience and responsibility for something outside of myself. He showed unconditional love and comfort (even in the times I fell short or let him down). I feel sad at how his life ended. 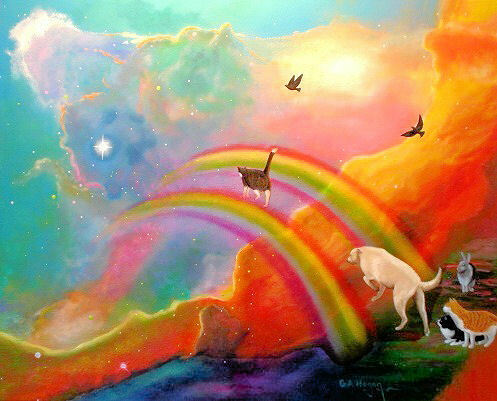 I wish the rainbow bridge were real so that I could tell him how much I loved him, how good he was and how much he helped me by just being there. I wish I could pat my chest again and that he would jump up put his hands on my shoulders in a standing hug. In a weird way this makes me think about other things I will have to face in my life (like losing a parent or family member). I miss him. Brahma, you were such a good dog. You were so sweet and caring and everyone loved you. I loved you. In our hearts forever. You were one of God’s greatest gifts, you will ALWAYS be with us Sweet Baby Girl.